(CNSNews.com) - Women earned approximately 57 percent of the bachelor’s degrees awarded by U.S. institutions of higher education in the 2016-2017 academic year, according to data released this week by the National Center for Education Statistics, which is part of the U.S. Department of Education. The NCES this week released a “first look” report—“Postsecondary Institutions and Cost of Attendance 2017-18; Degrees and Other Awards Conferred, 2016-2017; and 12-Month Enrollment, 2016-2017"—that listed the number of bachelor’s degrees awarded in the 2016-2017 academic year by U.S. institutions that participate in Title IV federal student financial assistance programs (plus the U.S. military academies). According to Table 4 of the report, these institutions awarded a total of 1,956,032 bachelor’s degrees in the 2016-2017 academic year. Of these, 836,045 (or 42.74 percent) were earned by men and 1,119,987 (or 57.26 percent) were earned by women. The 2017 version of Table 322.20 from the NCES’s Digest of Educational Statistics includes comparable data (from institutions that participate in Title IV) going back to the 1999-2000 academic year. According to that data, in each of the seventeen academic years from 1999-2000 through 2015-2016, women earned at least 57.11 percent of the bachelor’s degrees awarded in any given year but never earned more than 57.54 percent. By contrast, during those same seventeen years, men earned at least 42.46 percent of the bachelor’s degrees in any given years but never earned more than 42.89 percent. The lowest percentage for women in those seventeen years—according to this Department of Education data—came in the 2014-2015 academic year, when U.S. postsecondary institutions participating in Title IV awarded 1,894,969 bachelor’s degrees to U.S. citizens and nonresident aliens and 1,082,276 (or 57.11 percent) went to women and 812,693 (42.89 percent) went to men. The highest percentage for women in those seventeen years came in the 2005-2006 academic year, when the institutions participating in Title IV awarded 1,485,242 bachelor’s degrees and 854,642 (or 57.54 percent) went to women and 630,600 (or 42.46 percent) went to men. The last year that women earned less than 57 percent of the bachelor’s degrees awarded by U.S. institutions of higher learning participating in Title IV was in the 1998-1999 academic year. That year, according to Table 322.20 published with the 2016 Digest of Educational Statistics, these institutions awarded a total of 1,202,239 bachelor’s degrees. Of these, 519,961 (or 43.25 percent) went to men and 682,278 (or 56.75 percent) went to women. Data published in Table 236 of the 1995 Digest of Education Statistics, which includes bachelor’s degrees from institutions of higher education from the 1960-1961 academic year to the 1992-1993 academic year, shows that 1981-1982 was the first academic year in which women earned a larger number of bachelor’s degrees than men. In 1980-1981, according to this data, U.S. institutions of higher education issued 935,140 bachelor’s degrees. Of these, 469,883 (or 50.25 percent) were earned by men and 465,257 (or 49.75 percent) were earned by women. The next year—1981-1982—U.S. institutions of higher education issued 952,998 bachelor’s degrees. Of these, 473,364 (or 49.67 percent) were earned by men and 479,634 (or 50.33 percent) were earned by women. 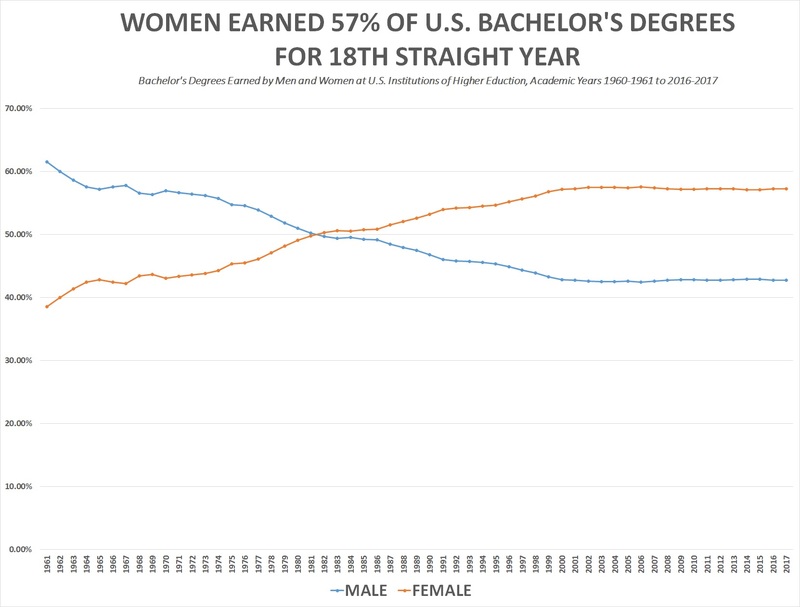 In each academic year since then, according to the data published by NCES, more women have earned bachelor’s degrees in the United States then men. Back in the 1960-1961 academic year, according to Table 236 of the 1995 Digest of Education Statistics, U.S. institutions of higher education awarded 365,174 bachelor’s degrees. Of these, men earned 224,538 (or 61.49 percent) and women earned 140,636 (or 38.51 percent). According to the report published this week by the NCES, women also earned more master’s degrees, doctoral degrees and professional degrees than men did in the 2016-2017 academic year. Table 4 in the report indicates that U.S. institutions participating in Title IV awarded 804,684 master’s degrees in 2016-2017. Of these 477,792 (or 59.38 percent) were earned by women and 326,892 (or 40.62 percent) were earned by men. The data also indicates that these institutions awarded 70,811 “research/scholarship” doctoral degrees. Of these, 35,620 (or 50.30 percent) were earned by women and 35,191 (or 49.70 percent) were earned by men. It further says that these institutions awarded 108,509 “professional practice” doctoral degrees in 2016-2017. Of these, 59,882 (or 55.19 percent) were earned by women and 48,627 (or 44.81 percent) were earned by men.